A few months later he opened Body Jewels in Chapel Hill, NC which was located right off the steps of UNC. This is where you could say that one year's experience was well worth ten. They were constantly piercing out of 3 shops on a daily basis. All this happened well before piercers were a dime a dozen. And with the sudden overflow of potential piercers came cheap jewelry and cheap work. It seems that no one takes pride in this trade anymore. Buster is a man who is proud of both the profession and the quality of work that leaves his shop. He held onto these values then, and still holds on to them now. Buster started piercing in 1992 and it was around this time that people started to take an interest in more than just the average piercing. 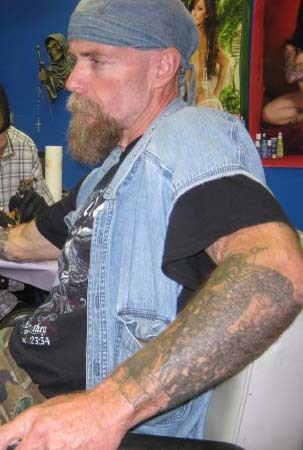 At the time he pierced out of Inkslingers in Durham, NC with his nephew Sean Cowan and soon found out about Body Design (a piercing school based in Long Island, New York) and quickly took the opportunity to learn from some of the best. Mike Fenn and his partner Nelson both were eager to share their years of experience in the classes that were offered.